Not much is known about Pop Fizz from before he became an alchemist. He belongs to the Skylander element magic. Pop Fizz constantly drinks his magic potions, which have changed his colors so much that not even Pop Fizz can remember what his original color was. He continues to make new magic potions, but they tend not to work out the way he wants them too. Pop Fizz even tried making a charm potion so that everyone would love him. Unfortunately it only resulted in creating the largest berserker display yet. Pop Fizz is very smart, and is the only one who understands Double Trouble’s native language. 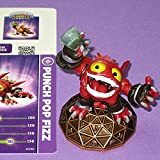 There is a Lightcore Pop Fizz figure, as well as a very rare Punch Pop Fizz figure. The giants story Thousands of years ago, the Giants fought epic battles in Skylands but were banished to Earth. With a new threat looming, it's time to bring them back to join forces with the Skylanders to defeat KAOS. Only you can put them on the Portal of Power® to unleash their strength in the ultimate battle to save Skylands! See Pop Fizz in Action! Pop Fizz - Gaints Skylanders Figure Wii U PS4 Xbox - Buy 3 Get 1 Free!